Very clever. I like it. I also love your new blog look. What a wonderful idea. You did an awesome job. When I first came on tonight I thought I was in the wrong place, I had to check twice. Love the new look. How wintery-looking! I love your new look. Your "frame" is just adorable! I know it is going to mean so much to him!! Oh, that frame is way cool, Susan - LOVE it! You did a wonderful job and it sure was sweet of you to make it and surprise Mr. P. :) Love your new blog look, too! Isn't it fun to be creative and do things in a new way? Good job to you and to them! Susan!! That is such a wonderful idea!! You are SO creative! It turned out wonderfully! 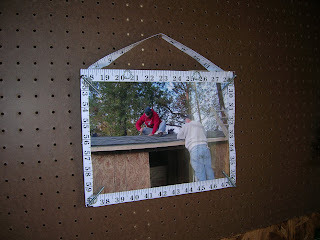 Congratulations to your men for the shed and to yourself for such a great idea! 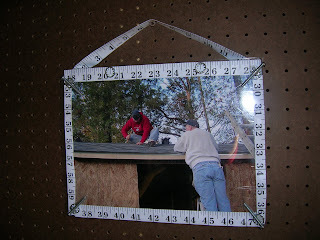 Susan, you did a great job with the frame. Very clever! Being resourceful gives such a good feeling. Congratulations to your guys for a job well done, too.